This report helps ensure that applicants are free of sanctions that would prohibit them from performing work under Medicare and / or Medicaid coverage. The reports include specific information regarding any sanctions and / or restrictions placed against the applicant. Results are available instantly via our website, Fastrax Select®. The information required is the applicant’s name and Social Security Number. Final reports include start date and expiration date of any sanction, location of violation, section of code violated and general description of violation. Click here for a medical sanctions sample background check. 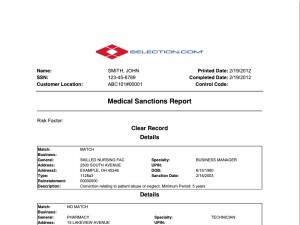 Click here for a full description of the medical sanctions background check report.